Though this Windsor Shiplap storage shed is described as having a traditional design, as you’ll see from the picture it actually benefits from a more unique stylish look. This is largely down to the overhang of the roof at the front of the building. The walls are made from super quality Shiplap tongue and groove cladding. This ensures the exterior has exceptional protection against the elements, as well as providing a smooth, professional design. It has also been dip treated to enhance its natural weatherproof build. Both the window and single door are situated at the front of the shed. The door is braced and has a strong pad bolt fitted which can be padlocked. The padlock isn’t included however. The window has a fixed design and it is styrene glazed for safety. Round edge standard framing on the interior helps to boost the sheds moisture resistance whilst also ensuring maximum stability. All in all we like this chic little shed. It offers a spacious interior, plenty of head room and excellent water resistance. It also comes armed with a 10 year anti rot guarantee, though annual treatments are needed to benefit from this. Packed full of character the building will complement any garden. Solid sheet floor is not suitable for heavy storage. You can add your own additional sheet of wood on top to improve its stability and strength however. This stylish storage shed is part of the popular Windsor collection and it is packed full of character and charm. So if you’re on the lookout for a shed with a difference, this is a pretty good contender. 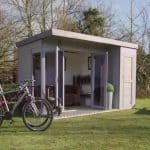 Whilst it isn’t very deep, it does offer a good amount of width and the door width ensures you can easily store wider equipment such as bicycles and lawnmowers. However, you will need to be wary of storing anything heavy as the floor really isn’t designed for heavyweight storage. This also means unless you strengthen it yourself, the building won’t be suitable for use as a hobby room or workshop. What it does offer is an extraordinary level of head height. With the ridge measuring 7’1”, this is taller than most competitor sheds out there. The roof has a dramatic design thanks to the large overhang at the front. This provides a slightly sheltered area and actually offers more water resistance than a standard apex roof design. Thanks to the overhang, the front of the shed will never be exposed to high levels of rainfall, even in the heaviest of downpours. There is also a very slight overhang at either side of the building which you can just about see in the picture. This also stops rain from running directly down the side walls, further enhancing its rot resistant benefits. It’s always disappointing for us to see solid sheet flooring. Whilst it is pretty common, you’ll find that it is quite thin. The roof is also constructed from solid sheet materials and it is basically a way for the manufacturer to save money. 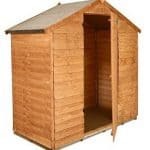 It is also a large contributor towards the low initial cost of the shed. It is possible to add a further sheet of thicker wood if you want to upgrade the building to handle heavier tools. 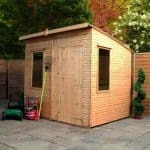 However, if you’re hoping to avoid any additional work then we’d recommend this shed to those who only have lightweight equipment to store. We can’t fault the cladding used in the construction of this building. High quality tongue and groove Shiplap ensures the shed doesn’t just withstand anything the UK weather has to throw at it, but it also looks good too. The signature design of Shiplap is the small indented groove found between each plank. This isn’t just there to make sure the timber has a more distinctive look; it also works to keep water away from the building. As the rain hits, this groove stops it from soaking through and instead channels it down to the ground. With tongue and groove there’s also the extra benefit of a tight interlocking design which also leaves a slight gap to accommodate for any alterations that may occur in the wood due to seasonal changes. Standard framing 28mm x 28mm is used throughout, but it has been rounded which gives it a smoother appearance. 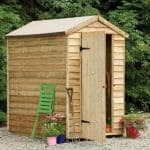 It also adds to the shed’s moisture resistance as well as boosts stability and reduces the risk of you or the family getting splinters. A lot of sheds these days are shipped with a basecoat treatment. This one however has been given a dip treatment prior to its shipment. This means the wood already has a strong weather resistant barrier. Perhaps the best thing about this dip treatment is that it eliminates the need for a treatment application after assembly. Though it is advised that you add your own treatment around 6 weeks after building, you could get away with leaving it longer than that. However, it does need to be treated annually if you want to reap the benefits of the 10 year anti rot warranty. Unlike a lot of sheds, the door and window cannot be moved to a different part of the building. To complement the offset apex design, both the window and the door are situated at the front of the shed. The door comes with a pad bolt attached to stop it opening on its own. It is also braced so the risk of sagging is greatly reduced. The styrene glazed window is fairly wide compared to the ones you find on competitor sheds. This means you get a greater level of lighting filtered through to the interior. However, it is fixed so it will not provide anything in terms of ventilation. Like a lot of sheds in this price bracket, you won’t find a huge level of security included. However, we do like that instead of supplying just a turn button, the manufacturer has supplied a pad bolt which enables you to add your own padlock to keep it strongly protected. As the window is fairly wide and covers a lot of the front of the building, there also isn’t much privacy. As we always recommend with Shiplap sheds however, you can add curtains or some other window covering. It’s unsurprising there aren’t many additional options with this shed. Though one thing that is a little strange is the fact Shed Store do not offer a padlock as an extra. They do sell them and this shed doesn’t actually come with a padlock supplied so we would have liked to have seen the option there to add one to your purchase. However, you can browse the site and find them independently. Out of the extra options it does come with, the garden building installation service is probably the most useful. This is a more unique building so it is going to be a little more difficult to build compared to simpler models. The only downside to this service is the cost. At £219, it can seem like too high of a price to pay but you need to take into account the stress it will save you. The treatments could be beneficial, especially if you want to change the colour of the building. However, as a free treatment is thrown in with the cost of the shed, you don’t technically need to buy another. The high quality extra treatments available do come in a choice of four colours and are environmentally friendly, quick drying and provide a high level of protection. A DIY assembly assistance tool kit is the other extra available. It features tools such as a saw, hammer, safety gloves, safety knife, a screwdriver and brushes to name just a few. This will come in useful if you opt for the self-assembly option as well as for any future outdoor buildings you invest in. We highly rate this for both the high quality materials used on the exterior and the unique attractive design of the shed. The cheaper solid sheet interior does lower the quality a little but all in all for what you pay, the quality is great. 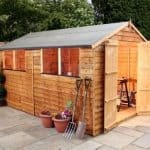 This shed does come backed by a 10 year anti-rot warranty so as long as you keep up the treatments, your investment in this shed will really pay off. You are given more width than depth so this may affect what you can store. However, it’s possible to add hooks or shelves to the interior to boost the capacity. No indication is given regarding how long this shed is likely going to take to construct. However, as it isn’t the largest of buildings we’d estimate it will take up to 4 hours. It’s going to be relatively simply to construct as full instructions are given. 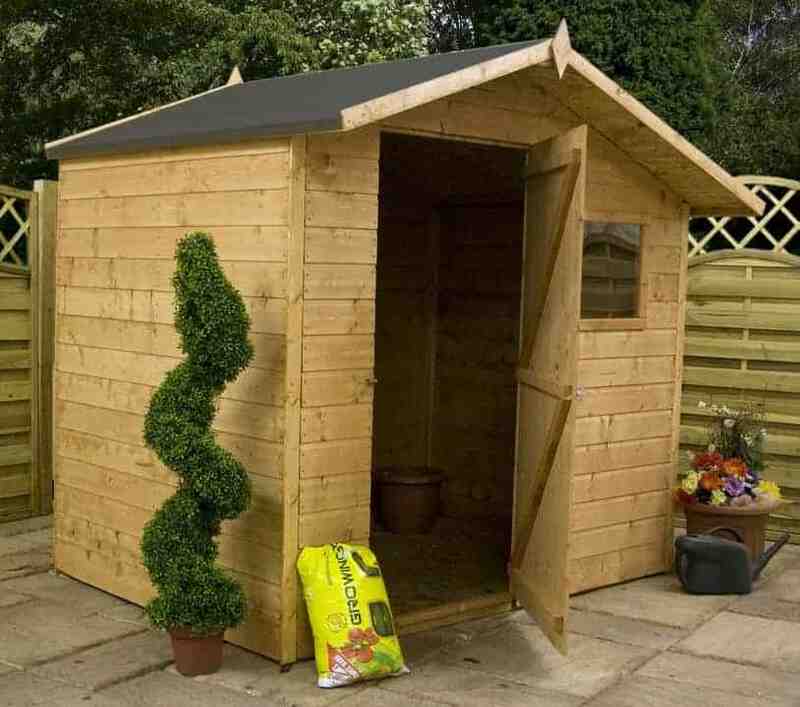 However, certain parts may prove tricky so always assemble the shed with at least 2 people. You will need to spend a little extra getting the shed more secure. 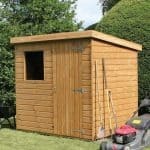 However, considering it attractive design and brilliant weather proof features we feel you are getting very good value from this shed. Final Thoughts: The impeccable Windsor Shiplap offset apex shed is a unique, high quality storage shed that is capable of holding a wide range of equipment. Thought the floor should be upgraded to accommodate heavier storage, the overall construction of the shed is fantastic. It offers a great amount of character and the exclusive roof overhang gives it a truly stand out design. With a great 10 year guarantee against rot, you can be sure you get more than your money’s worth with this great model. Whilst a pad bolt is added to the door, you will need to buy a padlock separately if you want to secure your storage.